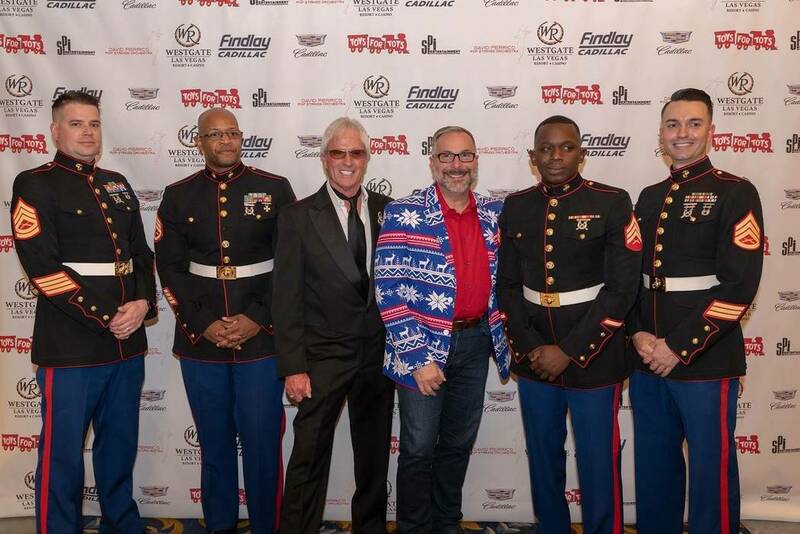 The 10th annual U.S. Marine Corps Reserve’s salute to Toys for Tots sponsored by Findlay Cadillac once again rocked the house Dec. 15 in the International Theater at the Westgate. In a setting renowned for past appearances by Elvis Presley, Barry Manilow and Gordon Lightfoot, the Toys for Tots show drew a packed house. Performers included David Perrico, with his 26-piece Pop Strings Orchestra, and Robby Steinhardt of the legendary band Kansas. Presented during the holiday Christmas season, the latest edition of Toys for Tots was a huge success. The event drew a crowd of more than 1,800 and collected a record amount of toys and cash donations. Attendees donated everything from soccer balls to bicycles. “Every child deserves a little Christmas,” said Thomas J. McGrath, chairman of Marines-Las Vegas Toys for Tots. Findlay Cadillac promotions manager L.J. Harness also said that the event was a big success. “This year’s show was our biggest-ever,” Harness said. “It was so big that we had to open the balcony. We had more than $300,000 in new toys and cash donations on behalf of the Marine Corps. Harness thanked all attendees and the entertainment family that delivered a home-run performance. The Marine Toys for Tots Foundation celebrated its 71st anniversary as the fundraising and support organization for Toys for Tots. In 2016, the foundation earned a ranking in the Philanthropy 400 for the first time. Toys for Tots began in 1947 when Maj. Bill Hendricks and a group of Marine reservists in Los Angeles collected and distributed toys to needy children. The Marine Toys for Tots Foundation is a not-for-profit charity and the authorized fundraising and support organization for the Toys for Tots Program. The foundation staff is headquartered in Cooper Center just outside the main gate of the Marine Corps’ base in Quantico, Virginia, about 35 miles south of Washington, D.C.
Toy drive campaigns are conducted annually in more than 700 communities covering all 50 states, the District of Columbia and Puerto Rico. The foundation also received Charity Navigator’s highest four-star rating for sound fiscal management. Led by General Manager John Saksa, Findlay Cadillac is located at 993 Auto Show Drive in the Valley Automall in Henderson. Further information can be found by calling 702-558-2600 or by visiting www.findlaycadillac.com. Findlay Automotive Group was founded in 1961 by Pete Findlay and now includes 33 dealerships in Nevada, Utah, Oregon, Idaho, California and Arizona. The latest addition to the company’s dealerships is Findlay Mazda, which opened Thursday in the Valley Automall.